Probably the right result this week in the wool market, where after the turbulence of the previous weeks the market had a settled tone to it. 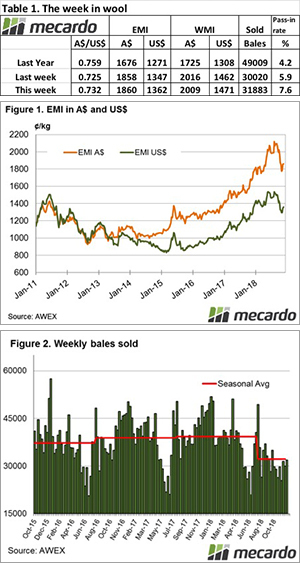 The two volatile aspects were the strengthening Au$ and the crossbred section where significant demand saw this end of the market rally strongly. The Eastern Market Indicator (EMI) improved marginally by 2 cents or 0.1%, ending the week at 1,860 cents. The Au$ was stronger by almost 1.0%, closing at 0.732 US cents. That put the EMI in US$ terms at 1,361 cents, a gain of 1% or 14 cents (Table 1). In Fremantle, the market returned a steady result with the Western Market Indicator (WMI) easing 7 cents to end the week at 2009 cents. Compared to the original roster posted last week, 34,513 of the 36,000 bales intended for sale this week came to the market. The solid market meant growers only passed in 7.6% of bales offered. This resulted in a clearance to the trade for the week of 31,883 bales, 1863 more than last week (Figure 2). When we look back to the 2017 season, for consecutive weeks 15,000 fewer bales have been sold. The dollar value for the week was $60.9 million, for a combined value of $1.34 billion so far this season. In the auction weeks since the winter recess, 546,024 bales have been cleared to the trade, 156,886 fewer than the same period last year. The average shortfall cleared to the trade compared to the same time last year continues to grow and now sits at 9,228 bales per week fewer. This week it was the Crossbred sections time to shine, Melbourne 28 MPG up 10% for the week with reports of 80 to 100 cent rises as buyers scrambled to obtain wool. 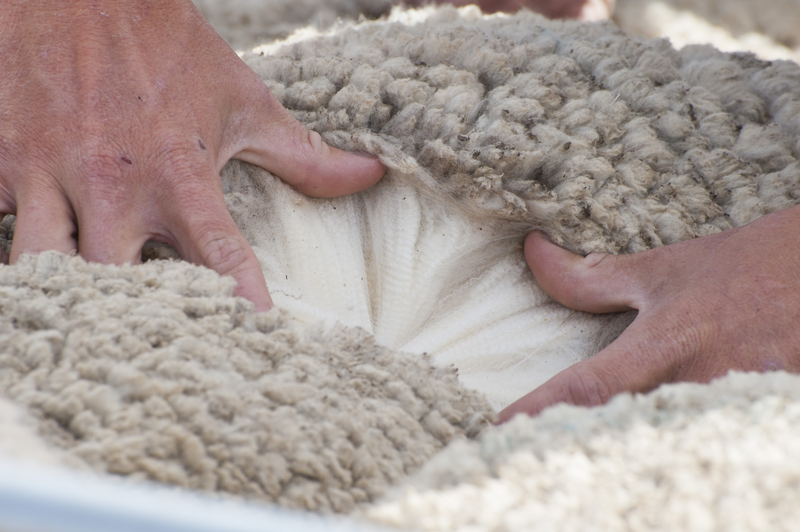 Across the board the Merino section held the line in the face of the stronger Au$, however, there was a varying demand observed for poorer styles and wool showing the effects of the drought. The lower NKt and poorer yielding wool is struggling due to the excessive volumes coming through. This is unlikely to change anytime soon. With just 2 weeks of selling prior to the Christmas break 39,500 bales on offer across the three selling centres on Wednesday and Thursday. A steady result would bode well for the New Year opening and what will be an interesting balance between a reduced supply and a healthy appetite for wool from processors.